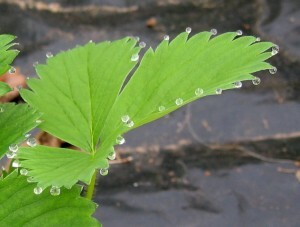 Plants that are kept in pots sometimes exhibit a strange phenomenon; there are droplets of water hanging at the end of the leaf while they have not been muddled. Guttation, as this phenomenon is officially called, can be caused by two things. Plants take in nutrients, minerals and moisture through their roots through a process we call osmosis. In short, it comes down to the fact that the roots first absorb nutrients so that the environment in the root cell becomes more saline than the environment outside. This means that the water is sucked into the roots. This water is then fed through the vascular bundle to the leaves. Here the water is then evaporated by the stomata. Normally this process is balanced, but if the roots absorb more water that the plant can evaporate, the root pressure becomes too high. This means that the water does not get enough time to evaporate, but will be immediately pressed out through the water pores (hydathodes) as a droplet. These are special water secretion glands at the leaf tips. Another cause may be too high air humidity. The saturated air then has insufficient capacity to absorb new water vapor. The water is then evacuated as a droplet rather than vapor. Because the air humidity often rises at night, guttation often occurs in the early morning. Guttation is not harmful to the plant. The phenomenon protects the plant from excessive root pressure. However, with houseplants the phenomenon can lead to annoying stains on the floor. Honeydew: a sticky liquid excreted by lice. The liquid is situated over the whole plant rather than only the leaf tips. You should also find lice on your plant.